Country of Issue – Niue. COMPOSITION 31.1 grams (1oz) of 0.999 silver. Depicts the Thirteenth Doctor alongside her TARDIS and friends: Ryan, Yasmin and Graham. FINISH Proof with colour. Ultra High Relief 2oz fine silver coin featuring the Sith Lord, Darth Vader, wielding his lightsaber, which is highlighted in colour to add further drama. Year of Issue: 2017. He remained in service of the Emperor -- the evil Darth Sidious -- for decades, enforcing his Master's will and seeking to crush the fledgling Rebel Alliance. STAR WARS DARTH MAUL 2018 Niue 1oz proof silver coin: The formidable warrior, Darth Maul, is the latest character to be featured on the. STAR WARS DARTH MAUL 2018 Niue 1oz proof silver coin. Trained as Darth Sidious’s first apprentice, he serves as a Sith Lord and a master of wielding a double-bladed lightsaber. Star Wars Celebration Chicago 2019 Exclusive Tots Darth Vader Unmasked - Anakin. Condition is New. Dispatched with Royal Mail 2nd Class. This exciting new coin collection begins with the Kylo Ren. TM 1 oz Silver Coin. A dark warrior strong with the Force, Kylo Ren. Coin Collection:Star Wars: The Force Awakens - Kylo Ren. TM commands First Order missions with a temper as fiery as his unconventional lightsaber. .999 PURESILVER LUKE SKYWALKER PRINCESS LEIA STAR WARS, COLLECTORS PROOF COIN IN MINT DISPLAY CASE WITH COA FROM RARITIES MINT GOLD # ON EDGE, Very Unique. Art round, B/U. It is really beautiful in its detail. Coin Collection:Star Wars: The Force Awakens. Star Wars character Rey. 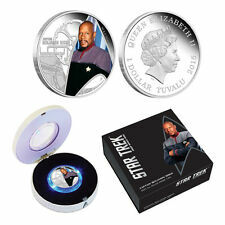 TM collectible coins has been released. The third coin in this exciting new collection is the Rey. TM 1 oz Silver coin. This impressive coin features a high-impact image of the much anticipated new. The blister is a high-quality reproduction of the POTF blisters that hold the collectors coin on top. The hole punch is real and the punched cardboard has been reinserted to give the "unpunched" appearance. 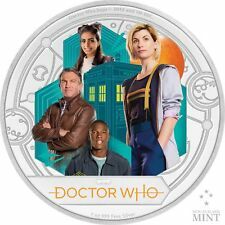 DOCTOR WHO SEASON 10 2017 Niue 1oz silver coin: The tenth series of. Country of Issue – Niue. COMPOSITION 31.1 grams (1oz) of 0.999 silver x2. 2018 -Depicts the Thirteenth Doctor alongside her TARDIS and friends: Ryan, Yasmin and Graham. The Twelfth Doctor edition, collectors gold colour coin featuring AM I A GOOD MAN?. 2” Brass coin beautifully presented in a red velour box. Genuine Star Wars Celebration Europe 2007 Medallion Coin Sweden Han Solo RARE!!! This could only be obtained from the Star Wars Celebration. This is from 2007 (12 years old!). and is HIGHLY sought after. Star of the hit TV show Posh Pawn! Star Wars Challenge Coin. Boba Fett on one side and Han Solo in Cabonite on the reverse. 44mm approx diameter. Ltd edition from one of the costuming forums a few years back. Will be sent 1st class recorded. Because you never know when the Alliance might be running an undercover sting operation, it's a good idea to carry one of these handy forms of Browncoat ID. The Certificate of Authenticity sits within the coin case. Engraved 1/4 oz Fine Gold coin featuring Han Solo from Star Wars Episode V: The Empire Strikes Back. This stunning engraved 1/4 oz gold coin features the face of Han Solo frozen in carbonite, as in the 1980 release of Star Wars Episode V: The Empire Strikes Back. This is a near impossible coin to get. Only given to sponsors and people who worked on the project. Back to the Future (1985). 248 Rise of the Planet of the Apes Rupert Wyatt 2011 action, drama, sci_fi, thriller. Character Feature film Animated TV series. 2003 "V2" (Part II & Part III) DVD No box Dolby 5.1 Yes Corrected Widescreen Yes. This was authenticated by CIB and signed off on by Tom Derby. The case is perfect and it displays the envelope and CIB COA beautifully. This is a very rare piece of Star Wars history. Collectable 99.9% silver Doctor Who coin presented in this electronic TARDIS presentation case. Open the left door of the TARDIS open to the familiar ‘vworp vworp’ sound to display the collectable and a numbered Certificate of Authenticity. STAR WARS OBI-WAN'S JEDI STARFIGHTER TITANIUM SERIES DIE-CAST Micro-Machines -AS PER PICTURES. Complete set of 20 Power of the Force style Star Wars Celebration Chicago 2019 Star Tots. Each Star Tot has it’s appropriate coin included. Condition is New. This could only be obtained from the Star Wars Celebration. This is from 2007 (12 years old!). and is HIGHLY sought after.